Rocky Mountain. 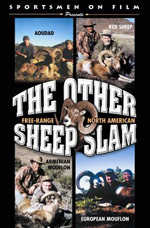 But there is another free-range North American sheep slam available to hunters consisting of Red Sheep, Armenian Mouflon, European Mouflon, and Aoudad. A Sportsmen on Film DVD production. In a 1948 article in TRUE magazine, Grancel Fitz first published the designation "Grand Slam" in reference to the successful hunting of the four indigenous North American wild sheep: the Dall, Stone, Desert, and Rocky Mountain. 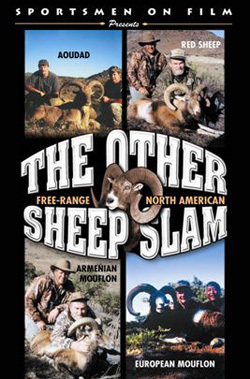 But there is another free-range North American sheep slam available to hunters consisting of Red Sheep, Armenian Mouflon, European Mouflon, and Aoudad. For Red Sheep and Armenian Mouflon, Jim Boulton hunts with Rowdy McBride on the famous Clayton Williams Ranch in West Texas. Then Ken Wilson travels to Hawaii to hunt pure European Mouflon on the big island with Gene Yap (whose young son, Matt, also shoots a good trophy in an exciting sequence). For Aoudad, Steve Jones of Blackcountry Hunts guides Ken Wilson on a successful mountain hunt south of Marfa, the highest incorporated city in Texas. For the challenge of free-range sheep hunting at a fraction of the cost of Grancel Fitz's Grand Slam, give The Other Sheep Slam a try!